USDA organic certified, this tea is made from leaves picked at the end of March. After a few years of aging, this tea exhibits a deeper golden hue and exudes enduring sweet plum and honey fragrances. After five infusions, the flavor of apple emerges and a strong “hui Gan” (sweet aftertaste) coats the entire mouth. 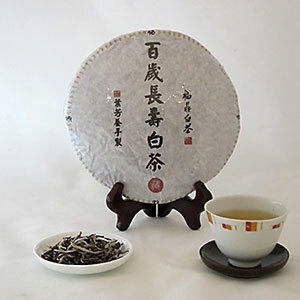 Aged white tea is very popular in recent years due to its reputed health benefits. Loose leaves are compressed into cakes to enhance aging. Store this cake in a dry and air tight container to avoid exposure to odors and humidity. Use 5g of leaves per 6 oz of water. Using 195 degrees F water temperature, steep for 30 seconds for three infusions. Then increase the temperature of the water and lengthen the steep time for subsequent infusions.